The Spencer Ellswood-built Midtown Depot arch, installed last Friday at the project site. Gourmet grilled cheeses, beer on tap, lawn games, a stage and local art – all in a spot that is pet and family friendly? 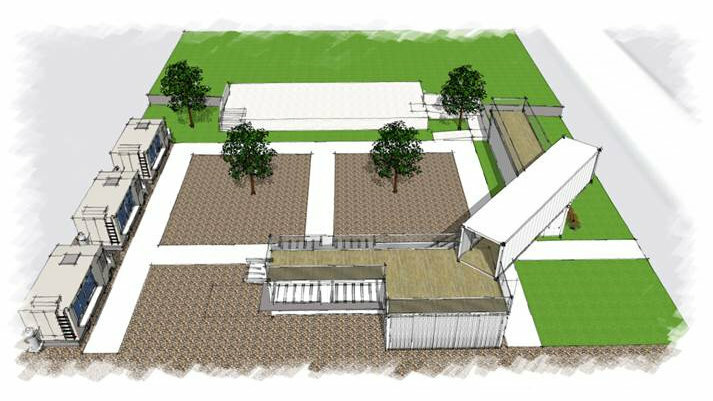 This is the plan for Midtown Depot, an outdoor venue and cultural hub in Jackson’s Midtown neighborhood, opening this summer at the corner of Livingston and Wilson Streets. 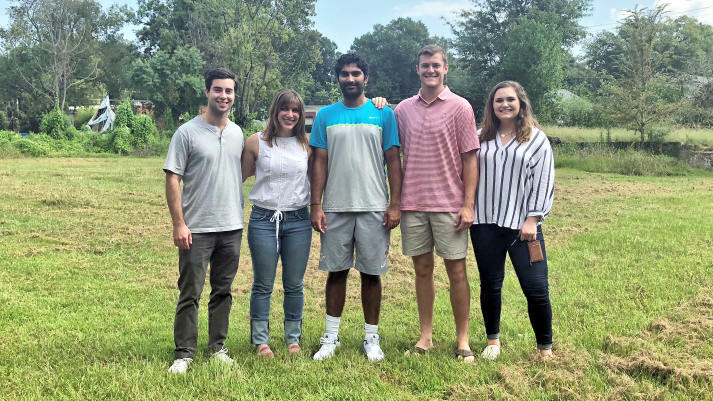 The project, founded by Millsaps College’s ELSEworks entrepreneurship program, began as a simple sketch in 2012 by ELSE student analyst, Russell Morrison. Seven years later, Midtown Depot has come full circle. “It caught the attention of our professors,” said Rachel Beck, a current ELSEworks student analyst. From there, community support lined up from Midtown Partners, Inc., The Business Association of Midtown and the Midtown Neighborhood Association. 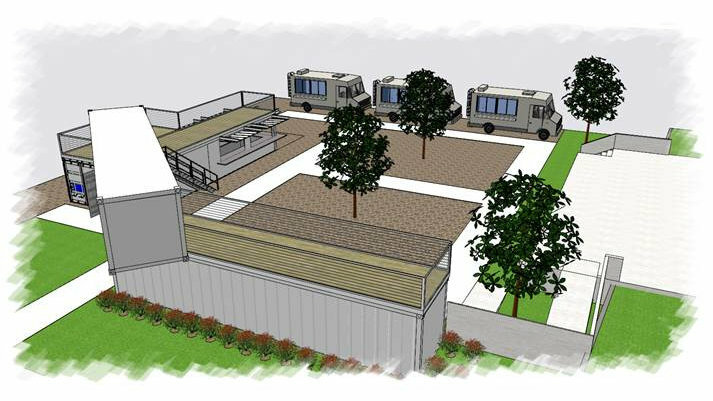 Three storage containers – one serving for restrooms and others for food and bar service, will stack for an upstairs deck area that looks across a lawn, perfect for community events. A test kitchen experience with Millsaps alumnus Jeff Good helped to create a grilled cheese menu – a concept popular in other cities – featuring seven sandwiches that pair great with beer. Like Loflin Yard in Memphis and Independence Beer Garden in Philadelphia, Pennsylvania, Midtown Depot will cater to a crowd that is looking for a fresh approach to their social life. “A lot of citizens want a space they can drink a beer and enjoy the outdoors, so that’s what this evolved into,” said analyst, Ty Durham. Art will play a major factor in the project. 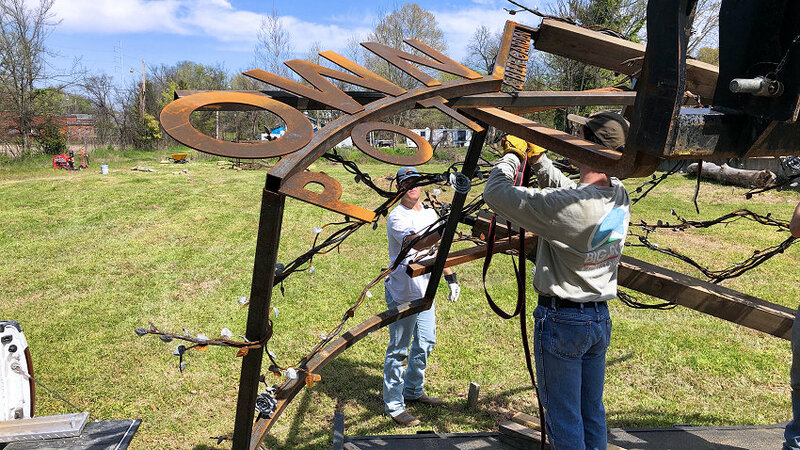 Analyst Spencer Ellswood, a metal artist, created a railroad tie sculpture that serves as Midtown Depot’s primary signage. Analyst Jordan Coopwood said the Depot would not be in the final stages without Midtown Partners. ELSEWorks has played a major role in area development, too, with student-led ideas that have helped businesses like Mississippi Cold Drip, Feast Specialty Foods, Heavenly Sweetz, and Natural Saga at The Hatch. Dining and entertainment options add to a holistic long-range plan. Midtown Depot started in 2012 on a sheet of paper and has evolved. While the current analysts will all graduate in May, the project will be handed over to the next class, well-informed with advisers and professors David Culpepper, Penny Prenshaw, Phil Hardwick, Ray Grubbs and Blakely Fender continuing to guide the way. “Each generation (of ELSEWorks analysts) has had a part,” Beck said. “Here we are, getting to the closing stages of it and it’s been a tremendous experience you really can’t learn in the classroom. Once containers are in place this spring, Midtown Depot will host pop-up events serving beer and food to introduce the development. Three to four months down the road, the Depot plans for a grand opening.